Humans by nature are visual creatures. 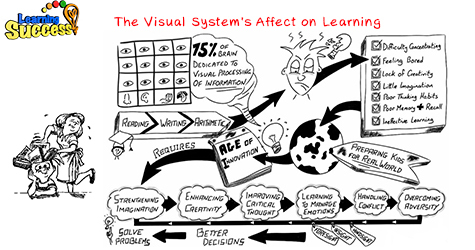 As a matter of fact, 75 to 90% of all that we learn comes to us through visual pathways. Knowing this, it’s important to identify children who may have weakened visual processing skills and give them a method to overcome these weaknesses. First, understand that 20/20 vision has very little to do with this. Second, you should have a general understanding of the anatomy of the eye. And finally, you will need some basic exercises to help the student overcome any of these problems. There are six tiny muscles that surround the eye and control its movements. They are known as the extraocular muscles. Four of these muscles control the eye’s movements from left to right and up and down. The other two rotate the eyes inward or outward. All six muscles work in unison to move the eye. As one contracts, the opposing muscle relaxes, creating smooth movements. Also, the muscles of both eyes work together so that the eyes are always aligned. If the eye muscles aren't working properly, then it is difficult for the eye to move smoothly across a page while reading. I often work with kids who have jerky eye movements. It isn't easy to see these jerky movements, but if you patch one of the student's eyes and move a pencil in front of the eye while having the student follow it, you can often see the eyeballs jerking sporadically. This makes learning quite difficult! The eye muscles must work smoothly for efficient learning to take place. If the eye muscles turn too far in or too far out, then it is difficult for proper perception to occur. Both eyes need to aim at the same point to have clear, single vision, and the student’s eyes must be able to move across a horizontal reading line or vertically up and down a math page in an efficient manner. There is more that can go wrong with the processing of visual information than that of just the muscles. Sometimes the brain will intermittently “shut down” an eye throughout the day. This is called suppression. Also, many students have an extremely difficult time focusing from a far plane of vision, back to a near plane of vision, and so on. This is called weak accommodation. Sometimes the student is unable to take the two images seen by two eyes and fuse them into one image. Often kids with learning problems will show poor depth perception, which can interfere with a lot more than learning. It is so important that kids see the world clearly. If their visual system is in the least bit compromised, then learning can be halted. It isn't hard to fix these problems at all. Just using some basic eye exercises regularly and consistently can strengthen eye muscles and make learning so much easier for these kids.